Woohoo!! I got the Weekend Poll up on SATURDAY!! All you Furries Fetish people voted for the Devil Spawn Chuck E. Cheese last weekend. So - let's keep going with the theme! Who do YOU think gives the best *spankings*? Chuck E. Cheese OR.... MR. SNUFFLEUPAGUS!! Who do YOU think gives the best *spankings*?! When I was but a wee one growing up in Ft. Sill, Oklahoma, I absolutely LIVED for Mr. 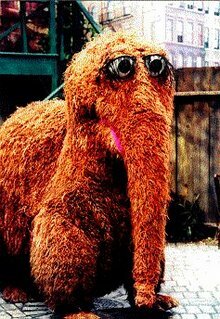 Snuffleupagus!! It drove me CRAZY that adults could never see Big Bird's beloved Snuffy. In fact - I would call my mother to the TV and say "THEE???? Mommy THEE???? Itth Mr. Thnufflapuaguth!!" (yeah - I had a lithp). And my mom, would tell me "Huh? I see Big Bird, but I don't see a Mr. Snuffleupagus!!" And you guys wonder why I'm insane. My mother and Sesame Street made me schizo. So there you have it. And remember, as always: VOTING IS MANDATORY!!! 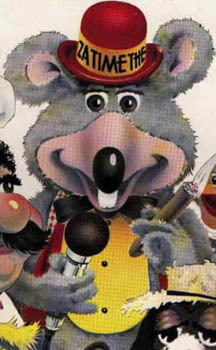 Chuck E Cheese looks like a freak. And I should know. Okay... I see it as Snuffy with the spanks, but I wanna know what Chuck there is gonna do with that cigar?